There is a lot to see and do throughout Poland. 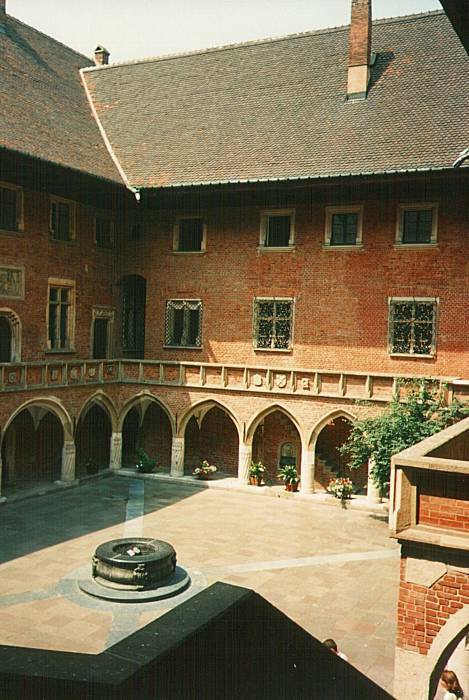 Here are suggestions for a trip to Kraków and the surrounding area. 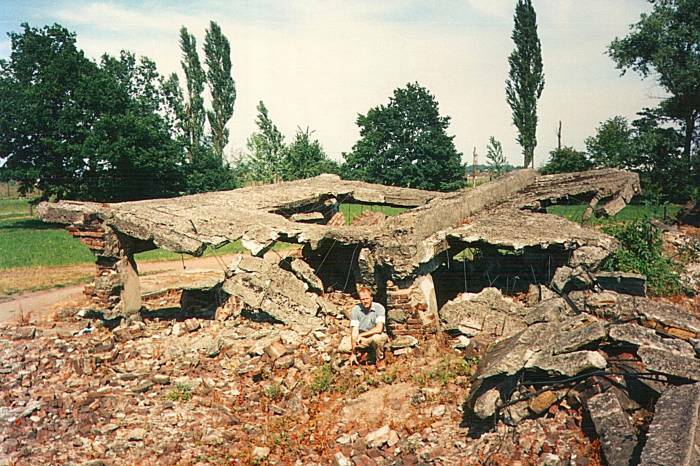 There are several sights from the German occupation during World War II, including a stone quarry on the edge of the city and the nearby concentration camps of the Auschwitz-Birkenau complex. U.S. Government map of Poland. Nazi Germany established a large number of concentration camps, extermination camps, and slave-labor facilities throughout Europe, including in Poland. Some of the many such facilities established in Poland alone were the Kraków-Płaszow concentration camp and several nearby armaments factories and a stone quarry, all of them utilizing slave labor. 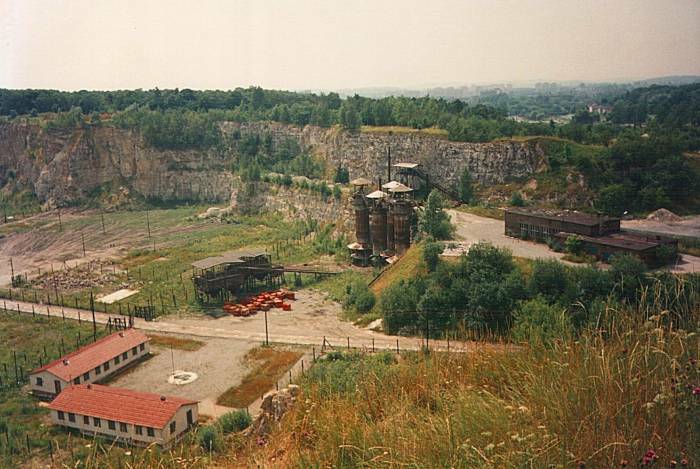 The stone quarry is still there, it's a short walk from central Kraków. The story of " Schindler's List" involved this quarry, and the relevant scenes in the movie were shot here. From the quarry rim you have a nice view over Kraków, and you can even see the factory which belonged to Oskar Schindler. 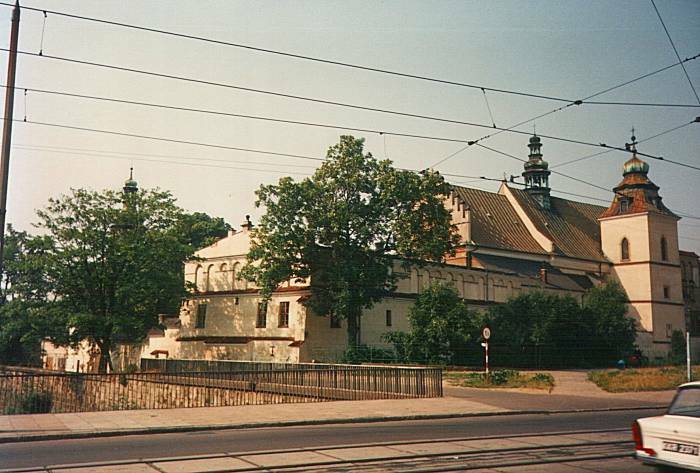 The Nazi SS built the Kraków-Płaszow concentration camp on top of two Jewish cemeteries in Płaszow, a suburb of Kraków now part of Podgórze district. It was intended as a slave labor camp from the beginning. The camp's commander was Amon Göth, an SS commander from Vienna who was even more sadistic even than the typical SS commander, if you can imagine such a thing. He is said to have shot at least one person before breakfast every day, and he personally oversaw the liquidation of the Kraków Ghetto starting in late October, 1942. He forced those Jewish inhabitants capable of slave labor into the Płaszow camp, and for the rest, either shot them on the spot or sent them to Auschwitz to be killed. The death rate for the people in the Kraków-Płaszow camp was very high through typhus, starvation and executions of both individuals and groups. Prisoners were brought in covered trucks three to four times a week. Those condemmed to immediate execution were marched to the large hill Hujowa Górka, forced into a trench in the hillside, shot, then covered with dirt. Many layers were built up in each of the trenches. In early 1944, the Germans became worried that they needed to hide the evidence of their large-scale atrocities. All the accumulated corpses were exhumed from Hujowa Górka and burnt. Witnesses later testified that seventeen truckloads of human ashes were hauled away to be scattered around the area. 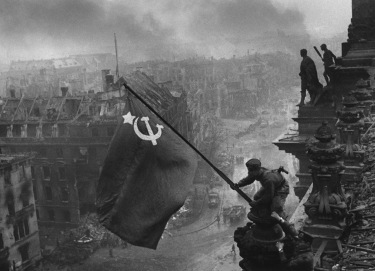 When the Nazis realized that the Soviet army was approaching Kraków and would capture the camp, they worked harder to cover up what they had done. They completely dismantled the camp, removing the buildings and leaving just a large open field. They then exhumed and burned the bodies that had been buried in mass graves within the camp itself. 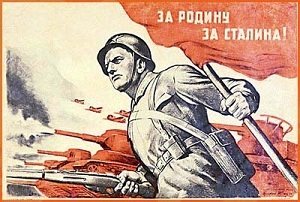 The Red Army reached the camp on January 20, 1945, to find nothing but a bare tract of open ground. The town of Oświęcim is about 50 km west of Kraków. The Germans were unable to pronounce the Slavic name and renamed it "Auschwitz". The nearby town of Brzezinka was similarly renamed "Birkenau". 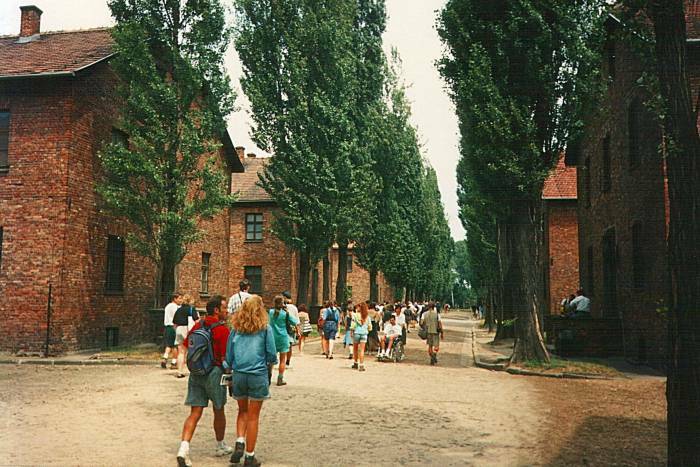 Auschwitz II, or Birkenau, an extermination camp or Vernichtungslager. 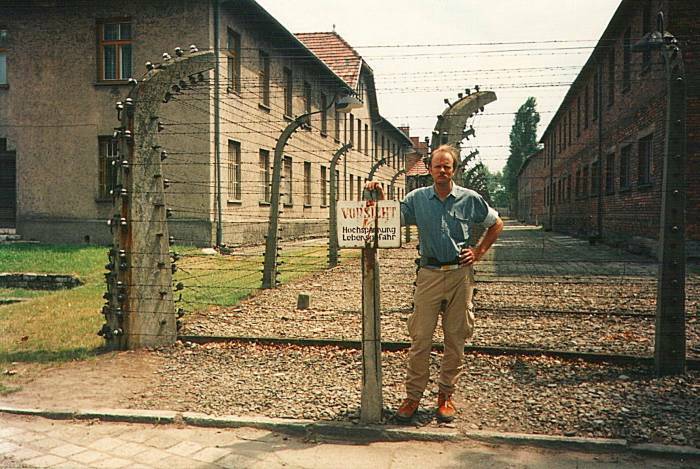 Auschwitz III, or Monowitz, a slave-labor camp. Plus 49 satellite camps up to tens of kilometers away. Click here for a list of those camps. 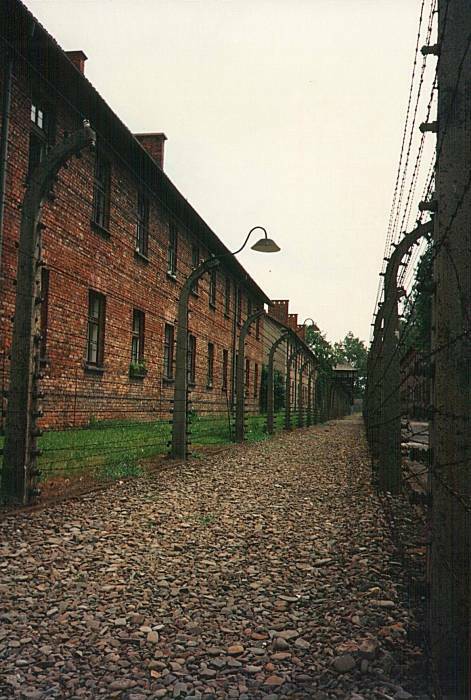 This is the fence at Auschwitz I. The Germans based Auschwitz I on an existing Polish army camp, re-using the brick barracks. The Germans imprisoned up to 20,000 people here at a time. The Germans seized all the possessions of arriving prisoners, most of whom had been led to believe that they were merely being "relocated" and so they should bring their most valuable possessions with them. The Germans made some attempt to hide what they had been doing when the Soviet Army approached Auschwitz toward the end of the war. However, the Soviets found large collections of personal possessions collected just within the past few days — eyeglasses, silverwear, jewelry, umbrellas, etc. Plus, of course, the gold the Germans harvested from teeth, and the piles of hair shaved from the arriving women. One display case in the museum is over 30 meters long and is completely filled with human hair. Just more Nazi German illogic — they were convinced that everyone else was sub-human, but they were still willing to use pillows and mattresses stuffed with the hair of "non-Aryans". A group of people are going to the museum in Auschswitz I. 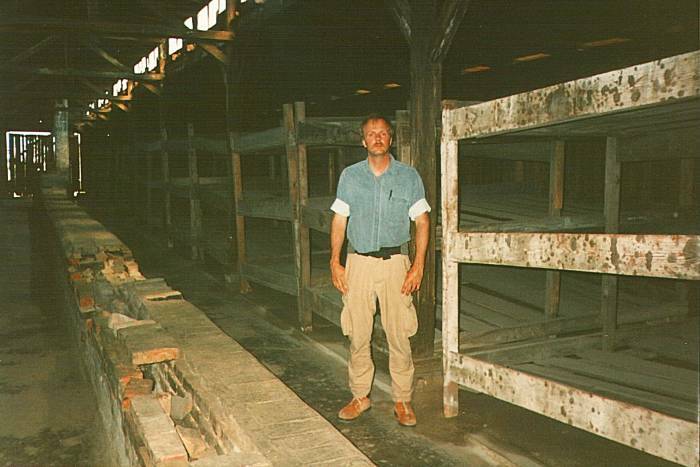 This is the view inside one of the few remaining wooden barracks at Birkenau (Auschwitz II). At least 1,100,000 people were killed just at Birkenau. The Germans killed most by gassing them, typically as soon as possible on arrival. But many more were killed through systematic starvation, intentional lack of disease prevention, and so-called "medical" experiments. Remember, Josef Mengele was the camp "physician". Ruins remain of the gas chambers and crematoriums. More than 20,000 people could be gassed and cremated every day. SS-Obersturmbannführer Rudolf Höss, camp commandant 1940-1943, estimated that they killed between 2.5 million and 3 million people at this one camp. Adolf Eichmann estimated 2,000,000. But despite (or maybe because of) the German efficiency in killing and cremating their victims, no complete list survives and there is a range of estimates. The current estimate is "at least 1,100,000". The neo-Nazis who deny the Holocaust use the uncertainty over just how many millions of people the Germans slaughtered as their "evidence" that maybe they didn't kill anyone at all. 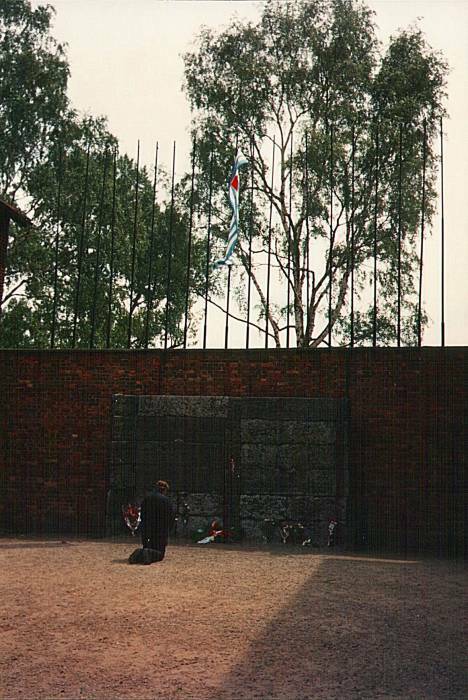 Höss was hanged in 1947 near the crematoriums. At least the last time I was there, there was a hostel inside a convent. The only drawback is that they close the gate at 2300, and once it's closed, the place is a fortress. Don't be late getting back! Here is the exterior and its courtyard. Wieliczka is another day-trip you can do out of Kraków. There is a large salt mine there, it has operated since the Middle Ages. 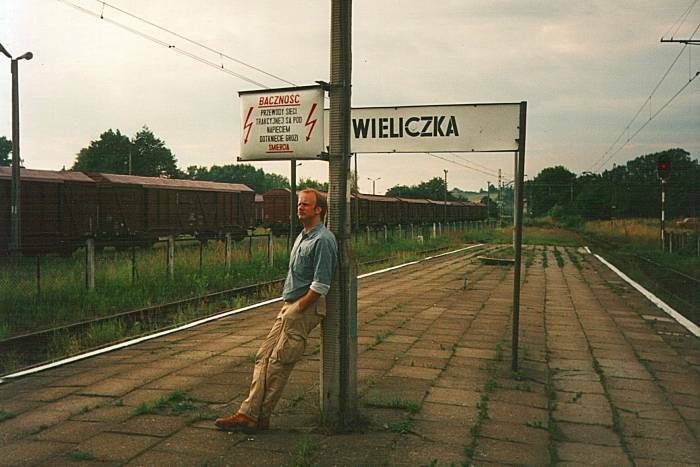 It's a much shorter trip, Wieliczka is just outside Kraków to the southeast. The mine was built in the 13th century and operated continuously until 2007. It reaches a depth of 327 meters. The miners carved statues all through the tunnels, and there is even a church underground, made entirely of salt. There is also a private rehabilitation complex down in the mine, especially for people with respiratory diseases. I don't have any pictures from the mine — have you ever tried taking pictures in a salt mine? For some pictures and lots of details see this page.